Dr. Iwamoto received his Bachelor of Science degree from UCLA. His post-graduate studies in optometry and subsequent doctoral degree were conferred from the Pennsylvania College of Optometry in 1982. Dr Iwamoto also received a coveted "Clinical Excellence Award" for patient care during his fourth-year rotations. He enjoys an active lifestyle including such activities as skiing, mountain biking, backpacking, fishing and scuba diving. 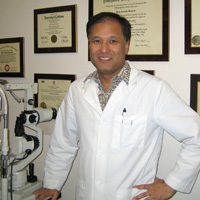 Rozsa H. is an ABO certified optician who has been helping San Diegans with their eye care needs since 1991. Prior to that, she spent eight years as an active duty Marine, during which time she had the opportunity to travel extensively. She enjoys learning about all the new developments in the optical industry so she can offer every patient the best options for their individual prescription and lifestyle. Rozsa takes extra care to make sure that each pair of eye wear dispensed is fabricated accurately and fits properly. She keeps the frame inventory fresh and current with new frame styles. She strives to provide exemplary customer service to each person who comes into the office. In her spare time, Rozsa enjoys spending time with her family, reading, and an occasional karaoke session. If you ask her about her children, be prepared to hear about extremely gifted and talented kids. She refuses to take herself too seriously and is always open to hearing a good joke. She is an animal lover and has offered her home to numerous wayward cats and lost dogs.